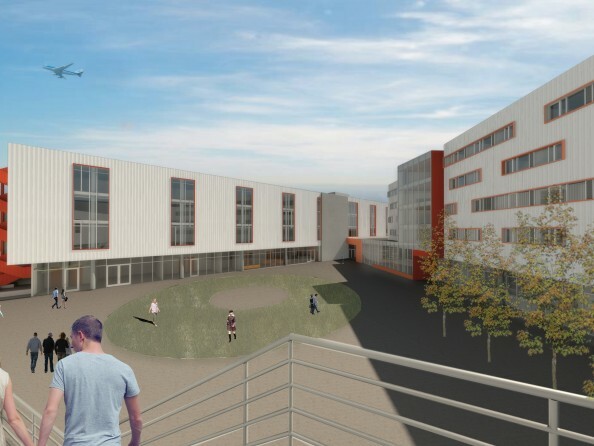 Westchester’s Otis College of Art and Design hopes that a proposed campus improvement plan will be a “game-changing opportunity” to help make the campus more competitive and appealing to prospective national and international students. The goal is to transform the school from a “regional commuter school to a national and international residential college” by constructing 96,200 gross square feet (GSF) of new buildings, which includes a 91,000-gsf structure consisting of a residential and academic wing joined by a 300-seat auditorium. The new residential wing is proposed at five stories and will include a library and kitchen with dining facilities on the ground floor and four stories of housing. When completed, there will be 234 beds arranged mostly in 4-person suites that share a common living and work area. There will also be one resident advisor unit on each floor. The academic wing will be four stories high and will serve as the new heart of the campus. The circular designed wing will house the student union and the resource center, as well as classrooms, studios and labs. The new buildings will be in line with the campus’ current architecture and will continue the use of clean, modern lines that are seen in some of the campus’ newer buildings like the Galef Center. The proposed project is also not expected to significantly impact any of the surrounding intersections. With the use of a vanpool and a Zipcar program, the school hopes to further decrease traffic to and from campus, as well as help reduce its carbon footprint. For Walk, the improvement project is necessary to help enhance the student experience at Otis by creating a residential community, by strengthening faculty and student interactions and enriching the students’ educational experiences through special events and programing. It will also help consolidate students and faculty that are at off-site facilities in Downtown Los Angeles and El Segundo. Walk says that Otis is proud to be located in Westchester and have the ability to enhance its campus. Walk is confident that improvements made to the college, which will celebrate its centennial in 2018, will help create a vibrant hub for the arts in the community. “The long-term vision is to have a unified campus and cultural center in Westchester. Through blended learning, low residency summer programs and adult continuing education, Otis plans to increase life-long learning and access to arts education in Los Angeles,” said Walk. The college is still working through the L.A. city planning process for its campus improvement project, but construction is hoped to begin in 2015. For more information, please visit otis.edu. Pictured: An artist’s rendering of the new building proposed for the campus Rendering Courtesy of Otis.